Alina Zagitova and Evgenia Medvedeva demonstrated their flawless performances during the Winter Olympics in Pyeongchang, winning the gold and the silver respectively in women’s single skating events. The girls shared their emotions with Sputnik about the Winter Games and the attitude to Russian athletes in South Korea, as well as described their lives after the tremendous success in Pyeongchang. The 15-year-old Alina Zagitova revealed her plans concerning the brand-new car the Olympic medal winners were presented with. “I will give it [the car] to my parents because they have deserved it too, they have been training me together with my coaches for the Olympics, but I think that in three years, I will take a license test to drive it on my own,” said Zagitova. As for the 18-year-old Evgenia Medvedeva, the young athlete is also excited about her new gift, saying that the vehicle is “like a living creature.” On behalf of the whole team she asked Russian President Vladimir Putin for a new ice rink “for a more creative scope,” and to continue supporting sports in the country, for her part. The two girls also addressed the attitude towards Russian athletes abroad. “As for the attitude, I can say that nothing has changed. They welcome us the same way the did at the Grand Prix. I believe that figure skating unites the world…,” said Medvedeva. Zagitova supported her colleague’s view as she had found out that her fans from Japan were going to present her with a dog. “Such support [from fans] is very important to me. This motivates me not to stop at what I’ve already achieved,” she added. The girls’ figure skating coach Eteri Tutberidze confessed that Medvedeva’s injury and illness were a game-changer during the Olympics. “I would like to thank the Figure Skating Federation of Russia for doing everything possible to help us go the way of the Samurai, solving our problems every year and every day,” Tutberidze added. 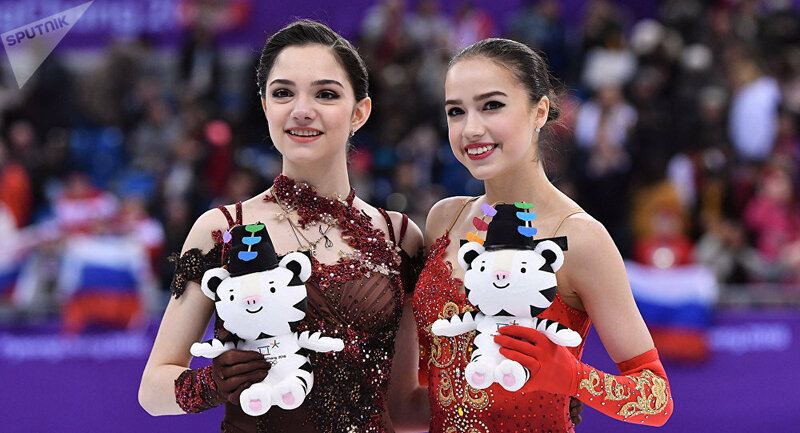 Alina Zagitova and Evgenia Medvedeva won the gold and silver medals respectively in women’s single skating events at the 2018 Olympic Winter Games in Pyeongchang. While Zagitova scored a total of 239.57 points, Medvedeva secured 238.26 points.